If you are developing a business application using ASP.NET MVC, and need to produce some kind of dashboard-style reporting, the Chart Controls from Microsoft are a good place to start. Having a summary in some form of document, say a PDF is also a common requirement. This article introduces you to satisfying both needs. A Senior executive came rushing out of his office and shouted at his underlings: "Has anyone seen my pencil?". "It's behind your ear" replied one of the team. "Come on! ", the executive demanded " I'm a busy man! Which ear?". We've all met them. These are the people for whom web page logins are a pain. They much prefer to have a document nicely formatted and printed, and put on their desk. By combining the Chart Controls with the free PDF utility, iTextSharp, you can deliver the best of both worlds. In previous articles, I have already covered both the Chart Controls and iTextSharp. Download instructions for both utilities are detailed in the previous articles, so I won't repeat them here. UPDATE: The chart controls are included as a native part of ASP.NET from version 4.0 onwards, which means that you do not need to download them separately if you are using VS2010. I will be generating a chart using LINQ to SQL to connect to the Northwind database, which is available here. In ASP.NET Web Forms, the chart controls are just that - server controls that can be dragged and dropped onto the Form Designer, and configured there. Within MVC there is no place for server controls, so we have to programme against their API instead. 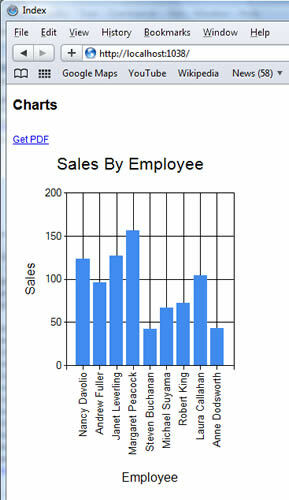 System.Web.UI.DataVisualization.Charting is needed so that you can work with Chart objects. PDFCharting.Models references the Models area of the application which contains the LINQ to SQL classes, and the final two references are there to avoid namespace clashes. There are a number of objects within the iTextSharp component which are named the same as commonly found .Net classes, such as Image and Font. Typically, to avoid the compiler complaining of ambiguity, you might use the fully referenced class name in code. For example, System.Drawing.Font. However, as an alternative, I have provided a namespace alias so that I can reference .NET classes without having to add the fully qualified name. We have seen that Charts are generated as images, and used two different derivatives of ActionResult to deliver them: FileContentResult to stream the binary content directly to the browser, and FilePathResult to return a file saved to disk. In addition, we learned the basics of binding a LINQ query result to the data points on a Chart. We have also seen how to add a byte array as an image to an iTextSharp PDF document, and finally learnt a bit about namespace aliases. This is a very simple example that is intended just to illustrate a starting point. The Chart() method should not normally appear within the controller itself, even as a private method. Not unless your application is very simple. From the point of view of maintainability and extensibility, you might find K Scott Allen's ChartBuilder class a good place to start in terms of separating the grunt work into its own area. If you are feeling really adventurous, there is no reason why you couldn't use the concepts presented in the ChartBuilder class to create a similar utility for building PDF files.